You are here: Home / Breed Profile / Shar Pei: Wrinkles you’ll fall in love with!! Who likes wrinkles? But, covered from head to toe with wrinkles, these Chinese dogs leave everyone at awe! Regal, proud, intelligent and absolutely clean dogs…that’s how the Shar Peis are. When we lost our Boxer dog, we were heart broken and thought we would never find a wrinkly headed dog to love again. That was the time when somebody mentioned that he could cheer me up with one look at a puppy that was wrinkled from the tip of his nose to the end of his tail! I didn’t believe such a dog existed and within minutes we were driving to see a litter basket full of the world’s most exotic and adorable little puppies. Before the day was out Okaah, our first Chinese Shar Pei came home as a gift from my brother. The unique experience of owning the rarest dog breed in the world turned me and my husband into enthusiastic dog breeders and exhibitors for life! Our Shar Pei loves to watch television. Don’t know if she can really see anything but she loves pretending to watch with us every evening for a few minutes. She has a particular spot on the bed that she occupies when she watches her television. She particularly enjoys programmes that make animal sounds like horse racing, and stuff on animal planet!! This wrinkled beauty sure is bitten by the TV bug, like all children are!! The Chinese Shar Pei (meaning sandy coat) is an ancient and unique breed, that has been existed for centuries in the southern provinces of China, apparently since the Han Dynasty (c. 200 BC). Statues bearing a strong resemblance to the Shar Pei have been discovered and dated to this period. Originally a multipurpose Chinese farm dog, today the Shar Pei is exhibited in conformation, agility, obedience and tracking. 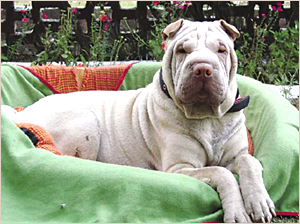 Shar Pei is an alert, compact dog of medium size; one of the rarest dog breeds. This breed can be recognised by his ‘hippopotamus’ head shape, walnut like wrinkles, dragon feet and butterfly nose. The Shar Pei, like the Chow-Chow, has a blue-black tongue; these are the only two breeds featuring this characteristic. A Shar Pei’s head is slightly large, and covered with profuse wrinkles on the forehead and the side, almost framing the face. His almond-shaped eyes display a scowling expression while his ears are extremely small and slightly rounded at the tips. Ears are set high and lie flat against the head. His muzzle is one of the distinctive features of the breed, which is broad and full. Another characteristic feature of a Shar pei is his high set tail, which is thick and round at the base. A Shar Pei can have two distinctly different kinds of coats: the horse coat (harsh to touch) and brush coat (soft to touch). They are found in different colours such as cream, apricot, fawn, red fawn, black, isabella, blue and chocolate. The Shar Pei is an intelligent breed, they are alert, dignified, sober but snobbish. Although unfriendly with strangers, they are extremely devoted to their family. The temperament of a Shar Pei is regal, which is completely a delight! Their head is always held high, and they love to be petted and cuddled. If you are looking for bright students, Shar Peis are for you…they are bright and learn quickly. They are very quick to learn toilet training…which of course is a big relief for all pet parents. And they are extremely clean…you will never see a Shar Pei rolling in mud. If left alone, a Shar Pei would sit quietly and wait for you to return. They are not scared of being left alone but hate it like most other pet dogs. Shar Pei loves games that involve running and chasing. If you have kids at home, they will be pally with them. Shar Pei requires moderate amount of exercise and two good walks a day are just what they need. This compact medium sized dog is well suited for apartment living and does not need a house with large gardens for free play though the same would be added bonus to his lifestyle! Shar Pei puppies are the cutest that one has ever seen. His excessively wrinkled look makes you go weak in the knees. Along with good feeding and lots of cuddling, a Shar Pei puppy needs to be pampered with some special attention to his eyes in particular as they are often covered with heavy wrinkles. Just keep them clean is the mantra that works best. Shar Peis are clean dogs that require little more grooming than an occasional bath, regular ear cleaning and toe nail clipping. They have short coat with hardly any hair fall. There are several misconceptions in people’s mind that Shar Pei can have skin disorders due to their heavy wrinkles. This is not true unless your dog has an illness!! But like most other dog breeds, they are also prone to some health problems, like entropian (eyelids curling inwards), Hypothyroidism, Demodectic mange and Swollen hocks fever. We can guarantee that once you have been bitten by the “Shar Pei love bug”… you’ll always want one. (For more info on Shar Pei, visit mysharpeipuppy.webs.com or call at 09779977588). http://www.dogsandpupsmagazine.com/wp-content/uploads/2010/05/breed02.jpg 134 250 Dogs and pups Magazine http://www.dogsandpupsmagazine.com/wp-content/uploads/2017/05/1254nal.jpg Dogs and pups Magazine2010-05-20 00:00:002014-02-07 17:40:33Shar Pei: Wrinkles you’ll fall in love with!! Abundant energy, love & intelligence!! Love thy pet, Love thy profession!